On Wednesday July 20, 2011 the Obama Administration announced their plan to close 800 of their 2,000 data centers over the next four years. 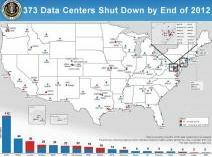 The Federal Government initially scheduled the shutdown of 137 data centers by the end of this year. However, currently the process is ahead of schedule with already 81 sites closed so they now expect the closure of 195 facilities. In addition to the revised figure of 195 data centers for 2011 the White House also announced that nearly 200 complexes will be closed by the end of 2012, making the accumulative shutdowns just shy of 400 data centers. Since 1998 the United States Government has quadrupled their amount of data centers. Throughout the years the development of software that allows for multiple platform access has enabled the government to become more efficient and reduce their need for most data centers. It is reported that many of these sites operate only using 27% of their computing power even though taxpayers continue to pay for the entire infrastructure (land, facilities, equipment, cooling processes and special security elements). According to the plans of the United States Government, the elimination of these data centers will help them be more efficient during this time of deficit. Over the next four years the shutdowns will allow for more real estate and a drastic reduction in unnecessary spending. The data centers that are marked for termination range in size with some occupying over 200,000 square feet and others residing on only 1,000 square feet of land. The geographic locations of these data centers also vary with locations scattered throughout 30 states. Due to the special equipment contained within these data centers the average power consumption can be 200 times more than regular office buildings and is enough to power 200 residential homes. This data center efficiency plan is aimed to save taxpayers over 3 billion dollars and greatly decrease environmental impact. Along with the plan to close these data centers the Government’s goal is to go in the direction of cloud services, first focusing on email and storage. The transition to cloud based computing provides a tremendous savings opportunity. According to an interview with Vivek Kundra, chief information officer for the federal government, tapping into cloud computing services could save an additional five billion per year. She also expressed that as the services continue to grow they will continue to transfer their efforts from redundant systems to improving the citizen experience. Absent from the announcement was the mention of job impact. Although data centers do not typically employ a tremendous amount of manpower, analysts still believe that tens of thousands of jobs could be displaced or impacted by future shutdowns. What do you think? Are the closures a good opportunity to reduce the Government’s wasteful spending and taxpayers to save money or is the possible effect on IT professionals too much? For more information visit The White House’s Blog. This entry was posted on Thursday, July 21st, 2011 at 12:18 pm	and is filed under Server, Storage. You can follow any responses to this entry through the RSS 2.0 feed. You can leave a response, or trackback from your own site.